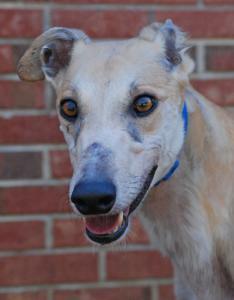 Chastity is a cute, little, fawn girl that raced at just 58lbs. She raced 112 races at Wheeling Downs and Orange Park and was pretty good, placing in a few Stakes Races. Chastity is a little shy at first but warms up pretty fast. Her sire is Rhythmless and her dam is Bob's Scorpion. Her birthday is July 12th. Chastity did pass her cat test. She has been living in a foster home around small dogs and is good with them too. She has also done very well with the small children she has met so should be fine in a home with them. Chastity settled in quickly to foster care and is very smart and is picking up basic obedience lessons quickly. She will sit for a treat now, down and is working on stays and fetch. Although she can be a little timid at first, she enjoys attention and likes to play with toys. She is very quiet in her kennel and goes potty on leash so would be a good apartment or townhouse dog. Chastity loves to lay in a baby pool on warm days. Chastity does better with other dogs around and seems to follow their example so would be most comfortable in a home with other dogs.